Surveyor 3 was the third lander of the American uncrewed Surveyor program sent to explore the surface of the Moon. Launched on April 17, 1967, Surveyor 3 landed on April 20, 1967, at the Mare Cognitum portion of the Oceanus Procellarum (S3° 01' 41.43" W23° 27' 29.55"). It transmitted 6,315 TV images to the Earth. 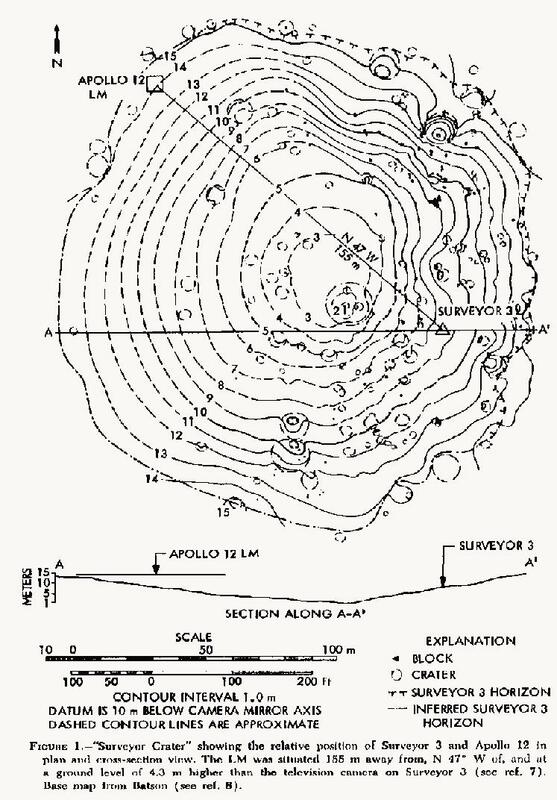 As Surveyor 3 was landing (in a crater, as it turned out ), highly reflective rocks confused the spacecraft's lunar descent radar. The engines failed to cut off at 14 feet (4.3 meters) in altitude as called for in the mission plans, and this delay caused the lander to bounce on the lunar surface twice. Its first bounce reached the altitude of about 35 feet (10 meters). The second bounce reached a height of about 11 feet (3.4 metres). On the third impact with the surface—from the initial altitude of 3 meters, and velocity of zero, which was below the planned altitude of 14 feet (4.3 meters), and very slowly descending —Surveyor 3 settled down to a soft landing as intended. This Surveyor mission was the first one that carried a surface-soil sampling-scoop, which can be seen on its extendable arm in the pictures. This mechanism was mounted on an electric-motor-driven arm and was used to dig four trenches in the lunar soil. These trenches were up to seven inches (18 centimeters) deep. Samples of soil from the trenches were placed in front of the Surveyor's television cameras to be photographed and the pictures radioed back to the Earth. When the first lunar nightfall came on 3 May 1967, Surveyor 3 was shut down because its solar panels were no longer producing electricity. At the next lunar dawn (after 14 terrestrial days, or about 336 hours), Surveyor 3 could not be reactivated, because of the extremely cold temperatures that it had experienced. This is in contrast with the Surveyor 1, which was able to be reactivated twice after lunar nights, but then never again. Surveyor 3 became famous after the crewed mission Apollo 12 used it as a landing target site. Landing within walking distance on 19 November 1969, the crew took several pictures of the probe and removed some pieces which were returned to Earth. Surveyor 3 is the only probe visited by humans on another world. The television camera on Surveyor 3 consisted of a vidicon tube, two 25 and 100 millimeter focal length lenses, shutters, filters, and an iris mounted along an axis inclined about 16 degrees to the central axis of the spacecraft. The TV camera was mounted under a mirror that could be moved in azimuth (horizontally) and elevation (vertically). The operation of the camera was completely dependent upon the receipt of proper commands from the Earth. Frame-by-frame coverage of the lunar surface was obtained over the complete 360 degrees in azimuth, and from +40 degrees above the plane normal to the camera's Z-axis to −65 degrees below this plane. Both 600-line and 200-line modes of TV camera operation were used. The 200-line mode transmitted over an omnidirectional antenna and scanned one frame every 61.8 seconds. A complete video transmission of each 200-line picture required 20 seconds and used a bandwidth of 1.2 kHz. The 600-line pictures were transmitted over a directional antenna. These pictures were scanned as often as once every 3.6 seconds. Each 600-line picture required a nominal one second to be read from the image vidicon, and its transmission required a 220 kHz bandwidth, using digital picture transmission. The TV photos were displayed back on the Earth on a slow-scan TV monitor that was coated with a long-persistence phosphor. Its persistence had been selected to match the nominal maximum frame rate. One frame of TV identification was received for each incoming TV photo, and the picture was displayed in real-time at a rate compatible with that of the incoming image. These data were recorded on a video magnetic-tape recorder. The camera returned 6315 pictures between April 20 and May 3, 1967, including views of the spacecraft itself, panoramic lunar surveys, views of the mechanical surface digger at work, and of an April 24 eclipse of the Sun by the Earth. The Apollo 12 Lunar Module landed near Surveyor 3 on November 19, 1969. Astronauts Conrad and Bean examined the spacecraft, and they brought back about 10 kg of parts of the Surveyor to the Earth, including its TV camera, which is now on permanent display in the National Air and Space Museum in Washington, D.C. The soil mechanics surface sampler was designed to dig, scrape, and trench the lunar surface and to transport lunar surface material while being photographed so that the properties of the lunar surface could be determined. The sampler was mounted below the television camera and consisted primarily of a scoop approximately 120 mm long and 50 mm wide. The scoop consisted of a container, a sharpened blade, and an electric motor to open and close the container. A small footpad was attached to the scoop door to present a flat surface to the lunar surface. The scoop was capable of holding a maximum quantity of approximately 32 mm diameter of solid lunar material and a maximum of 100 cm³ of granular material. The scoop was mounted on a pantograph arm that could be extended about 1.5 m or retracted close to the spacecraft motor drive. The arm could also be moved from an azimuth of +40 to -72 degrees or be elevated 130 mm by motor drives. It could also be dropped onto the lunar surface under force provided by gravity and a spring. The surface sampler performed seven bearing tests, four trench tests, and 13 impact tests. The total operating time was 18 hours, 22 minutes on 10 separate occasions. Measurements of motor currents and forces applied to the surface were not obtained due to the state of the spacecraft telemetry following landing on the lunar surface. However, estimations were possible. The small spring constant of the torque spring precluded the determination of density from the impact tests. Penetrations of 38 to 50 mm were obtained from the bearing tests, and a 175 mm depth was reached during trenching operations. The design of the mechanism and its electronic auxiliary was more than adequate for the lunar surface operations. Charles Conrad Jr., Apollo 12 Commander, stands next to Surveyor 3. In the background is the Apollo 12 Lunar Module, Intrepid. Alan L. Bean, the Lunar Module pilot of Apollo 12 captured the image. The Surveyor 3 landing site was later selected also as the landing target for the Lunar Module of the Apollo 12 crewed lunar mission in 1969. Several components of the Surveyor 3 lander were collected and returned to the Earth for study of the long-term exposure effects of the harsh lunar environment on human-made objects and materials. Although space probes have returned to Earth in the decades since Apollo 12, this remains the only occasion on which humans have visited a probe that had been sent off-world. It is widely claimed that a common type of bacterium, Streptococcus mitis, accidentally contaminated the Surveyor's camera prior to launch, and that the bacteria survived dormant in the harsh lunar environment for two and a half years, supposedly then to be detected when Apollo 12 brought the Surveyor's camera back to the Earth. This claim has been cited by some as providing credence to the idea of interplanetary panspermia, but more importantly, it led NASA to adopt strict abiotic procedures for space probes to prevent contamination of the planet Mars and other astronomical bodies that are suspected of having conditions possibly suitable for life. Most dramatically, the Galileo space probe was deliberately destroyed at the end of its mission by crashing it into Jupiter, to avoid the possibility of contaminating the Jovian moon Europa with bacteria from Earth. The Cassini probe also impacted Saturn at the end of its mission in 2017. In 2009, the Lunar Reconnaissance Orbiter (LRO) photographed the Surveyor 3 landing site in some detail, in which surrounding astronaut foot tracks could also be seen. In 2011, the LRO returned to the landing site at a lower altitude to take higher resolution photographs. Wikimedia Commons has media related to Surveyor 3. ^ Thurman, Sam W. (February 2004). SurveyorSpacecraft Automatic Landing System. 27th Annual AAS Guidance and Control Conference. Archived from the original on 2008-02-27. ^ "NASA - NSSDCA - Spacecraft - Details". nssdc.gsfc.nasa.gov. Retrieved 2017-08-14. ^ "Earth microbes on the Moon". Science.nasa.gov. Archived from the original on 2010-03-23. Retrieved 2009-07-20. ^ "Lunar Reconnaissance Orbiter images of the Surveyor 3 landing site". Retrieved 2009-09-04. ^ "Lunar Reconnaissance Orbiter returns to the Apollo 12/Surveyor 3 landing site in 2011]".